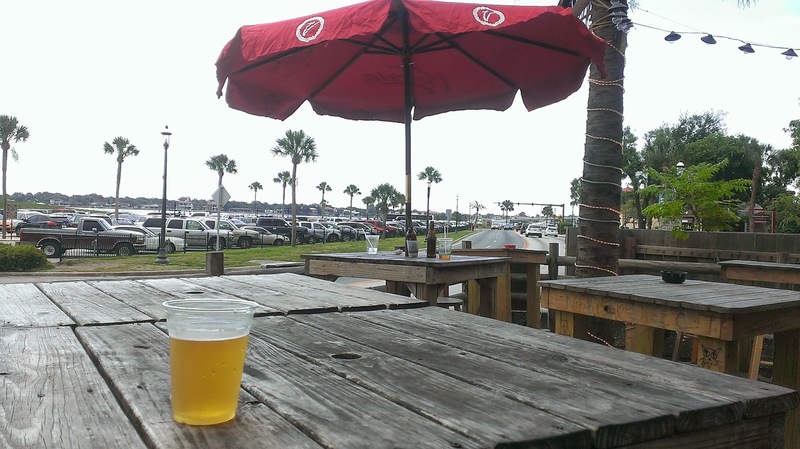 I recently stopped by No Name Bar (or is it The Bar With No Name) on Castillo Dr. in downtown St. Augustine. Surprisingly, I had not been here before, but I've driven by a bunch of times and have seen the crowds there, so I figured they must know something. It was a reunion of sorts, as one of my favorite bartenders with whom I worked at Mile Marker Brewing, Miguel, now works here. Hugs all around, and great to see him again! He's always been entertaining to say the least. No Name Bar is a cool little place to relax and people watch overlooking the Castillo (the fort) and the beginning of Avenida Menendez. There's an outdoor deck with seating under umbrellas, as well as indoor seating along a bar. Not a big place, but cozy. Three tv's run along the bar. People watching or beer watching? Both, maybe. It has a full liquor bar, live music and an assortment of beers. Personally, I'd like to see more craft beer and local craft offerings, but this list will typically appeal to the masses (combination of draft and bottle): Intuition I-10 IPA (local craft from Jax), Goose Island 312, Magic Hat No. 9, Sam Adams, Sierra Nevada, Session lager, Stella, ShockTop, Yuengling, Red Stripe, Guinness, Heineken. And, yeah, you can get the PBR Tall-boy 16 oz cans for $2, too, if cheap is your thing. If you get the munchies, there's a small grill menu that features typical bar food (burgers, shrimp, fish tacos, fries) til 7pm. Feel like taking something back with you? There's an attached liquor store, but you'll need a bartender to access it.